A Cathedral dedicated to St Paul has overlooked the City of London since 604AD, a constant reminder to this great commercial center of the importance of the spiritual side of life. 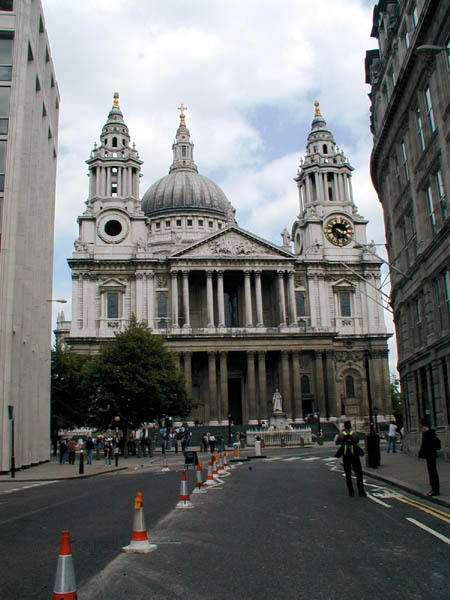 The current Cathedral – the fourth to occupy this site – was designed by the court architect Sir Christopher Wren and built between 1675 and 1710 after its predecessor was destroyed in the Great Fire of London. As the Cathedral of the capital city, St Paul’s is the spiritual focus of the Nation. This is where people and events of overwhelming importance to the country have been celebrated, mourned and commemorated since the first Service took place in 1697. Since then important services have included the funerals of Lord Nelson, the Duke of Wellington and Sir Winston Churchill; Jubilee celebrations for Queen Victoria, King George V; peace services marking the end of the First and Second World Wars; the launch of the Festival of Britain; the Service of Remembrance and Commemoration for the 11th September 2001: the 80th and 100th birthdays of Queen Elizabeth, the Queen Mother; the wedding of Charles, Prince of Wales, to Lady Diana Spencer and, most recently, the Thanksgiving for the Golden Jubilee of Her Majesty the Queen. Over the centuries, St Paul’s has changed to reflect shifting tastes and attitudes. Decoration has been added and removed, services have been updated, different areas have been put to new uses. Today, the history of the nation is written in the carved stone of its pillars and arches and is celebrated in its works of art and monuments. In the crypt are effigies and fragments of stone that pre-date the Cathedral, relics of a medieval world. The American Memorial Chapel stands behind the High Altar in an area that was bomb-damaged during the Second World War – a gesture of gratitude to the American dead of the Second World War from the people of Britain. An altar has now been installed on a dais in the heart of the Cathedral, bringing services closer to those who attend them. Throughout, St Paul’s has remained a busy, working church where millions have come to worship and find peace. It is a heritage site of international importance which attracts thousands of people each year, a symbol of the City and Nation it serves and, above all, a lasting monument to the glory of God.